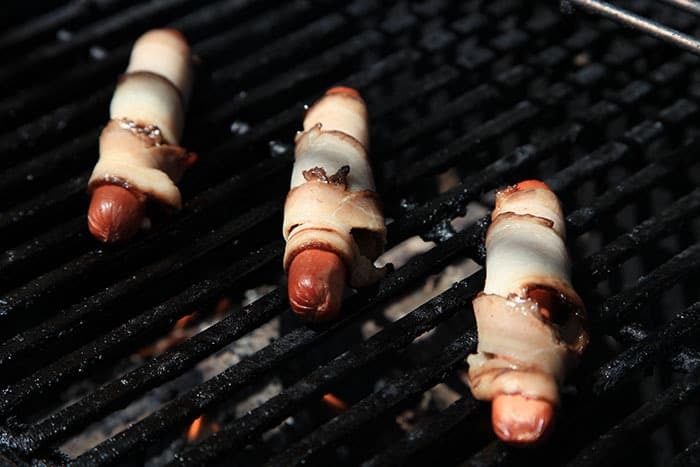 Ahh, the bacon wrapped hot dog. ‘Tis an LA street-food specialty, to be bought from a cart after clubbing all night, dripping with delicious hangover busting grease and savored bite by bite. 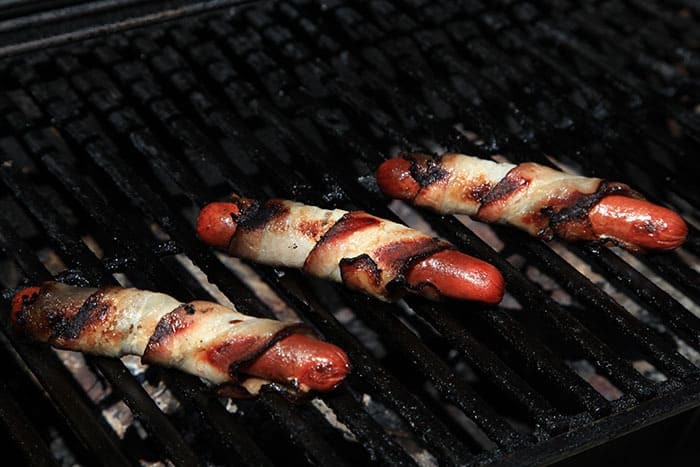 I may have aged out of 2 a.m. post-clubbing street food, but I still love the bacon wrapped hot dog for summer BBQ’s. 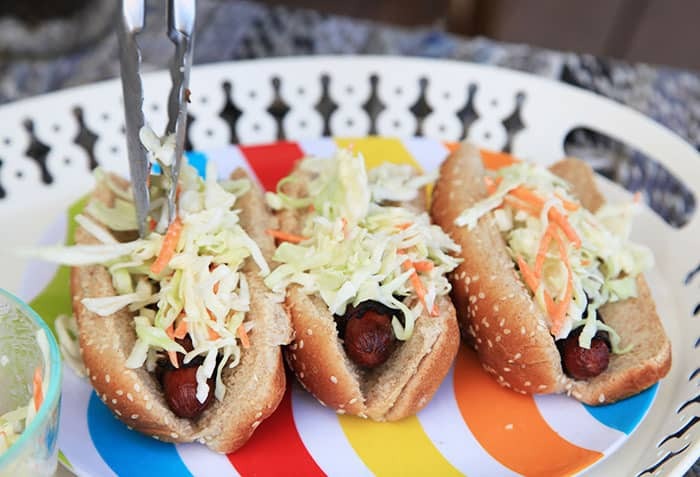 Another delicious trick I’ve picked up is to put coleslaw directly on your hot dog. I am not usually a fan of coleslaw, but since my husband’s twin brother moved to Nashville, married my awesome sister in law, and had a couple babies, we’ve been visiting quite a bit. I always make sure to stop by Noshville, since my BIL introduced me to their “Francheesy,” which is basically a hot dog with cheese and coleslaw on it. 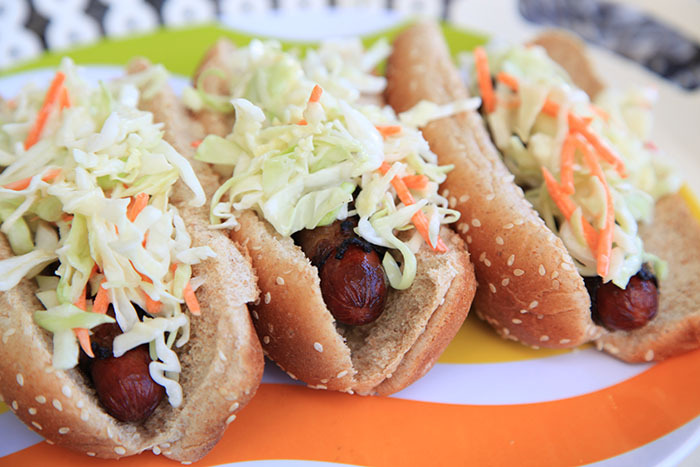 There is something magical that happens when you combine a hot dog and coleslaw. I can’t explain it, you just have to try it. And once you wrap your hot dog in bacon, then top with delicious coleslaw, well, it’s heaven in your mouth. 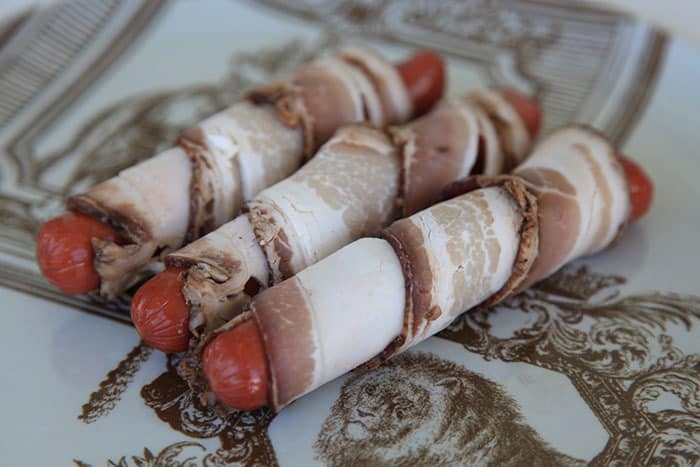 First, wrap your hot dogs in bacon. That’s pretty simple. Now throw them on your pre-heated grill. Let them cook for a while, the fat will drip off. When one side of the bacon browns, turn them. The hotdog will take longer to cook since it is wrapped in bacon, don’t worry about cooking the bacon and burning the dog, won’t happen. Now for the slaw. Just chop some cabbage. You can also add shredded carrot or whatever you prefer (maybe more bacon?). 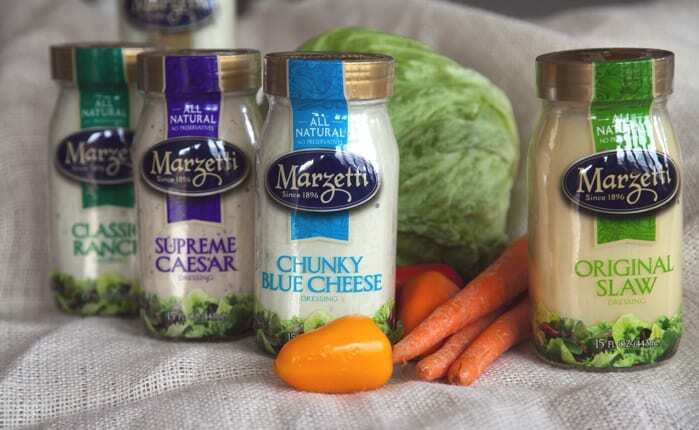 Pour on the Marzetti Original Slaw Salad Dressing (I went with Light despite my bacon-wrapped hot dog indulgence because as my friend Jon says “it’s never too late to stop the bleeding,” and this light version is just as tasty as the original). Pull your hot dogs off the grill, place in bun. 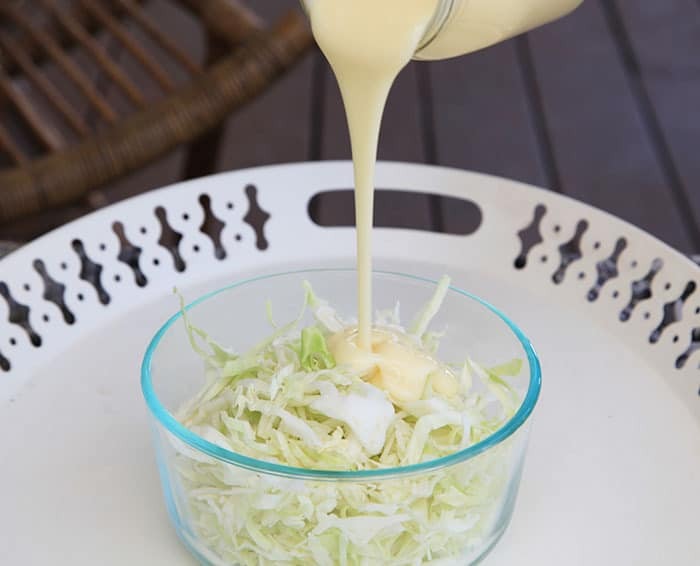 Add shredded cheese if you really want to indulge, then top with the cool coleslaw. Take a bite. It’s amazing, right??? 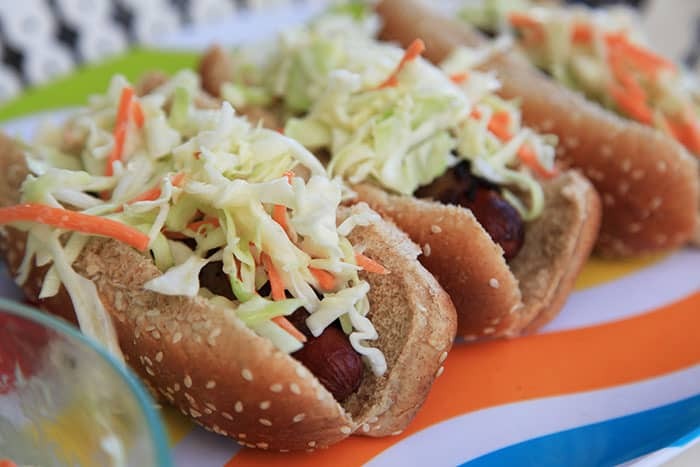 Something about that cool refreshing coleslaw makes the rich bacon hot dog taste even richer? You know you love it. To enter to win this wonderful gift set leave a comment below with your favorite kind of salad. Mine is definitely something in the ranch family, perhaps with some BBQ chicken mixed in. For additional entries tweet, stumble, or share the giveaway on Facebook and leave a comment each time letting us know. Come back and leave a comment every day from now until May 8th at midnight. We will announce the winner here on Prudent Baby. I love a good Asian noodle salad, I could eat it for days! These hot dogs sound amazing, can’t wait to try the recipe. I love a chopped salad filled with anything and everything, but it HAS to include blue cheese, tortilla strips and a creamy dressing. Hands down a wedge salad with chunks of bleu cheese and bacon!! I like a salad with romaine, napa cabbage, a light sesame-ginger dressing, and grilled chicken. My favorite salad is a barbecue chicken cobb salad. Delicious and perfect for summer! I love Chinese Chicken Salad! Greek salad is great but I love iceberg with red wine vinegar and salt. It sounds nasty but is so good. I love a cobb salad with ranch dressing and avocado. Thanks for the chance to win! a strawberry spinach salad with a poppyseed vinaigrette is my favorite. My favorite is pork barbacoa taco salad with cilantro lime dressing! I love a good Asian mandarin orange salad. I love an Asian salad, with mandarin orange slices in a dressing with sesame oil. Spinach strawberry salad in late summer. Divine! I tweeted about this giveaway on Twitter at https://twitter.com/likwan/status/329852260521738240. I love all salads,but coleslaw is something really magical! I nver thought to put it ON a hot dog. However, it tastes heavenly on pulled pork sandwiches! lettuce and spinach and every available vegetable from my garden. Would have to be some sort of cranberry walnut salad w/ sweet balsamic dressing & blue cheese crumbles. Yum! I like strawberry poppyseed salad! Caesar salad. I would crave it when I was pregnant. 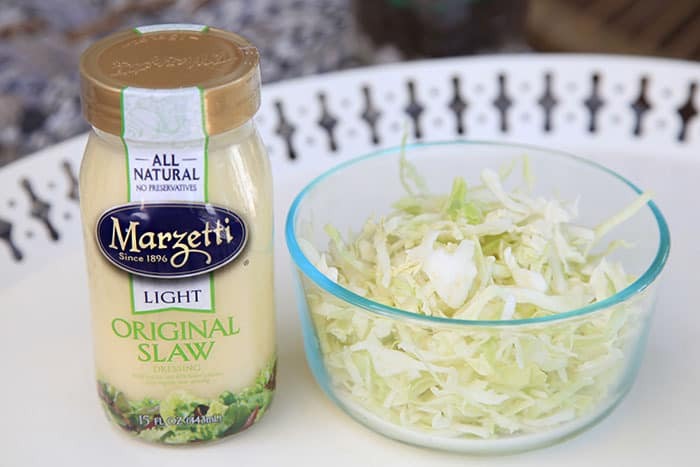 I love chicken salad and I always use Marzetti’s slaw dressing for it. I love multi leaf salads with chunks of fresh avocado and ranch. You know that pretty cole slaw would be just a bump better with some poppy seeds added. I love taco salad with ranch or french dressing on it that is my favorite. You want “likes” on facebook and followers on twitter and in google+ and all the rest of the “cool” places you think you need to be in…..but did it EVER dawn on you to support the communities you want to like you? Stop on by, post to the folks and tell them you’re happy to be connected to them and show some initiative. Life is a two way street…..I know that’s something they no longer teach in college so that’s a free tip on me!.